Posts on my blog may contain affiliate links, which help support my blog at no additional charge to you. See my disclosure policy. 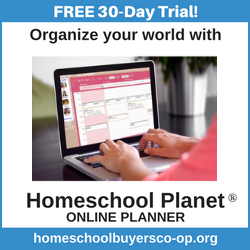 February is a good time to take a look at how everything is going in your homeschool and decide if anything needs to change or be adjusted. Join me as I do my mid-year review of our homeschool and evaluate what’s working and what’s not! I’ve been doing this homeschooling thing for a lot of years. I was homeschooled for 7 years, and I have homeschooled my own kids now for 9 years. You would think that with 16 years of experience, I would have this homeschooling thing down-pat. But I have learned over the years that each year is different. Each kid is different. And sometimes that shiny new curriculum you were so excited about in August is not the best fit for your family right now. Take this year’s science for example. We chose Christian Kids Explore Chemistry for Superman and Princess this year. We started the year all excited about all of the great experiments we would be able to do, and everything we were going to learn about chemistry. My plan was to work on it together two days a week, and have lots of fun together. Only one problem. We didn’t do it. I am a busy work-at-home mom, and while I love to be involved in their learning, I sometimes just need them to be able to do their school work without my help. So we have changed the way we are doing science. Princess is now doing the reading and completing the notebooking pages on her own, and I will only be helping with an occasional experiment. We are all much happier with this arrangement. Superman will continue his science learning through books and videos that he can complete on his own. He is a science-minded kid, so I feel confident that he will learn plenty just exploring his world. Mid-year review – So what’s working? We have a few things that are working really well, and a few things (like science) that needed a little tweaking. Beezus is doing several of her classes online through Virtual Homeschool Group, and as my little social butterfly is flourishing there. We will probably try to stick with these classes as long as we can get the classes we need. I am considering a subscription to Schoolhouse Teachers for next year’s History and Science. Math seems to be going well for all of my kids. Princess and Beezus are using Saxon Math and doing the homework online at Virtual Homeschool Group. It works out beautifully because there are short videos for most lessons and it is all graded online. And it’s Saxon. Which is the best math curriculum out there for middle and high school, in my opinion. At least for our family. Superman is using Mathematical Reasoning from Critical Thinking Company for the second year in a row. He does really well with it, and it doesn’t require much teacher interaction, so it’s a win-win for us! Language Arts is a little harder to quantify as we do a lot of literature discussion and verbal analysis of grammar, but Superman and Princess HATE to write! So for now, we will probably just stick with verbal composition or narration, and will be working in some more real writing as they get older. Superman reads his Pathway Readers aloud daily for reading practice and seems to not hate that, but he still hasn’t taken off with his reading yet. He voraciously devours audiobooks, but still avoids reading a print book. For now, I’m ok with that. I have really struggled with finding an amazing Language Arts program for Princess. We started out the year with Intermediate Language Lessons, but she balked. So I bought Learning Language Arts through Literature, and still no dice. She is enrolled in the IEW Nose Tree Fix-it Grammar class on VHSG and gets lots of reading and literature through our history program, so I think I’m just going to stick with that for the rest of the year, and revisit Language Arts again in the fall. If you have any really great suggestions for a gentle Language Arts program, please let me know. I don’t know why it has been so hard for me to find a good program for Princess, but nothing has quite fit. Beezus is using IEW’s Fix-it Grammar and US History-Based Writing programs and is excelling in both. She did start off the year with LLATL too, but I think the IEW programs have been plenty. This is a subject where she naturally excels so I am confident she will be ok.
I’ve already talked about science above, so I won’t go into a deep discussion here. Just suffice it to say, we had to change things up for the youngers. Beezus has been using Apologia Physical Science from the beginning of the year, and seems to really love it. If you have followed my blog for any amount of time, you know this is my favorite subject to teach (and learn!) But… I think my love of history has caused a problem with following any history program. I love to dig deep, and use the books I can find at the library to learn about the time periods we are studying at the moment. So I have finally decided to just forget using a history curriculum and just build our own program. I lean heavily toward literature-based history with a hands-on project or notebooking page thrown in here or there. I’ve pretty much decided to just stick with TruthQuest History as a guide and create my own curriculum based on what I have on hand or can get at the library. We will still read some of the books that came with the program I chose at the beginning of the year, and skipping some of them. This post is a part of the iHSN linkup for the week. Go on over and see how every one else is fairing right now. So that’s where we are right now. I will be doing some more review soon in preparation for next year’s homeschool planning. So how is your school year going? Have you changed or rearranged anything recently? I’d love to hear about it! Connect with me on Facebook! Thanks for sharing about the Virtual Homeschool Group for saxon math! I had no idea! We LOVE it! I kind of stumbled on VHSG a few years ago and it has been a wonderful tool in our homeschool! Glad I could help! I love reading these they are like mini-curriculum reviews 🙂 So helpful! Fun-loving, second-generation homeschooling momma to three, single mom by circumstance, and frugalista by necessity. Come join us as we live Life as Lanhams! Sign up for access to my exclusive Subscriber Library! Copyright © 2019 Amy E. Lanham. All rights reserved.